As for business, my favorite would be Good Strategy / Bad strategy by Richard Rumelt. When you read a title like this, you most likely end up wondering whether it is going to be another strategy book loaded with buzz words but lacking in articulate content. Well, this one clearly delivers. It paints an accurate picture of the problem surrounding strategy and explains why there’s so much bad strategy all around us. What a CEO or entrepreneur will find extra useful is the fact that the book also exposes what you need to do in order to create good strategies. I loved Good Strategy/Bad Strategy, by Richard Rumelt. It had many stories and examples about how strategy is often misconstrued, and what leaders can do to ensure they have a proper strategy. If you want to think about strategy, the proper strategy, how to understand what to do, what not to do, read: “Good Strategy, Bad Strategy”, “Good to Great” and “Blue Ocean Strategy”. A good strategy is a specific and coherent response to—and approach for overcoming—the obstacles to progress. A good strategy works by harnessing and applying power where it will have the greatest effect in challenges as varied as putting a man on the moon, fighting a war, launching a new product, responding to changing market dynamics, starting a charter school, or setting up a government program. Rumelt’s nine sources of power—ranging from using leverage to effectively focusing on growth—are eye-opening yet pragmatic tools that can be put to work on Monday morning. and pursue a “dog’s dinner” of conflicting policies and actions. Rumelt argues that the heart of a good strategy is insight—into the true nature of the situation, into the hidden power in a situation, and into an appropriate response. He shows you how insight can be cultivated with a wide variety of tools for guiding your own thinking. 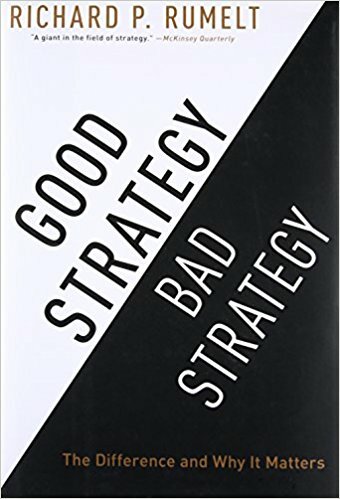 Good Strategy/Bad Strategy uses fascinating examples from business, nonprofit, and military affairs to bring its original and pragmatic ideas to life. The detailed examples range from Apple to General Motors, from the two Iraq wars to Afghanistan, from a small local market to Wal-Mart, from Nvidia to Silicon Graphics, from the Getty Trust to the Los Angeles Unified School District, from Cisco Systems to Paccar, and from Global Crossing to the 2007–08 financial crisis. Reflecting an astonishing grasp and integration of economics, finance, technology, history, and the brilliance and foibles of the human character, Good Strategy/Bad Strategy stems from Rumelt’s decades of digging beyond the superficial to address hard questions with honesty and integrity.